These metal and ceramic cat pillboxes feature the portraits of three very distinguished cats. The oval pillbox is 2 1/2" wide x 1 3/4" high x 1/2" deep. The pillbox has a ceramic top and ceramic base. There are no dividers inside the box so it holds a variety of pills. The design at the top is called the grey cat. 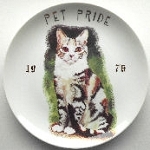 The design on the bottom left is a medium haired orange cat (sold out); the design on the bottom right is a short haired orange cat. Select your favorite style. Only 1 of each design left.